The hens are molting. When they start replacing feathers, they stop laying eggs. We have feathers everywhere, but only about four eggs a day. Until production picks back up I suppose we could offer dozens of tattered feathers! Order yours today! I'd say "supplies limited" but I've not found that to be true. The hen house looks like somebody bombed a pillow factory. 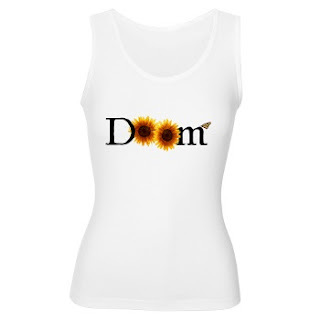 Instead, how about a Garden Riot Doom tank top perfect for hoeing and weeding, or a Red Wicket logo bag to carry home your goods from the area farmer's markets? All from our new CafePress shop. Anyone who buys something from the store before April 15, 2009 can pick up a complimentary dozen eggs...um, when the girls start to lay again in a few weeks. (just keep a copy of your order confirmation page).